Emma woke with a start. Had she heard someone call her name or had she been dreaming? She laid there, the campfire having dwindled to embers and the camp itself eerily silent. Not a soul stirred, nor a sound could be heard. She knew that guards had been posted on the perimeters of the camp, so they were well protected, but somehow that did not settle her unease. She sat up and saw that Rogan was sleeping soundly on the other side of the campfire, her stirring not having roused him. She looked over the camp and saw that all the warriors appeared to sleep as soundly as Rogan. “Patience?” She looked around, expecting to see her sister. When no one in the camp reacted to her shout, she knew something was wrong. “Dreaming,” she said softly. She had to be dreaming. She did as Patience said and rushed off into the woods. It was so dark that she could barely see anything, yet her feet seemed to know where to take her. Footfalls turned Patience silent and Emma looked around, frightened by the heavy steps drawing ever closer. Emma turned to run and nearly stumbled as she stopped abruptly. Before her stood a massive figure draped in black, the hood of his cloak drawn down over his head and face. His arms were spread out from his sides, making it appear as if he had massive wings. A black mist swirled at his feet and began to creep toward her. She looked around to run, but it was too late, the mist was licking at her legs and she could not move. He had her trapped. She trembled as the black mist crawled up along her body. She had never seen anything so sinister or felt so frightened, and she reacted out of sheer instinct…she let out a blood-curdling scream. 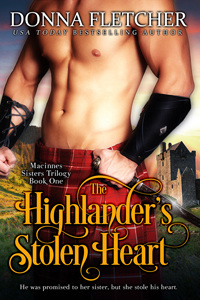 Look for more excerpts coming throughout May and leading to the June release of The Highlander’s Stolen Heart, first book in the Macinnes Sisters Trilogy. Awesome! I can’t wait to read this one. I love your books. Happy to know you enjoy my books!